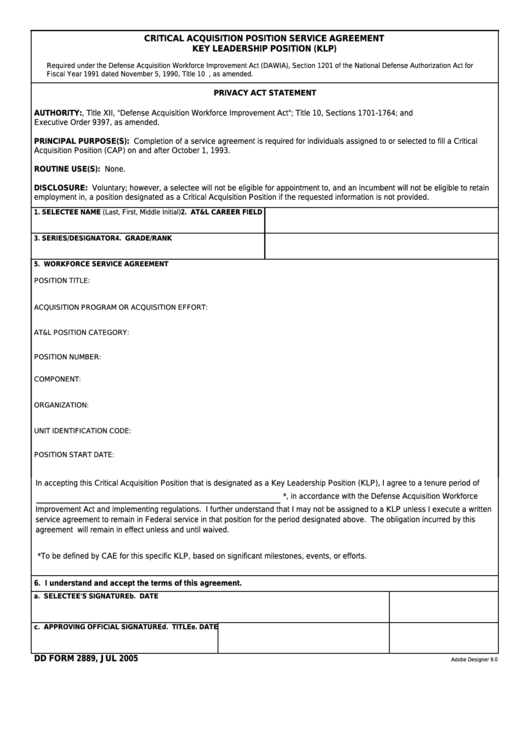 Download a blank fillable Dd Form 2889 - Critical Acquisition Position Service Agreement - Key Leadership Position (Klp) in PDF format just by clicking the "DOWNLOAD PDF" button. Complete Dd Form 2889 - Critical Acquisition Position Service Agreement - Key Leadership Position (Klp) with your personal data - all interactive fields are highlighted in places where you should type, access drop-down lists or select multiple-choice options. agreement will remain in effect unless and until waived. *To be defined by CAE for this specific KLP, based on significant milestones, events, or efforts.